Buzz a Fuzzy (Ready, Aim, Fuzzy! in PAL regions) is a General minigame from Mario Party: Island Tour. The 4 players are seen standing on a wooden bridge, and squares with Fuzzies on all 4 corners appear in the sky. The camera fades in to the player's view. 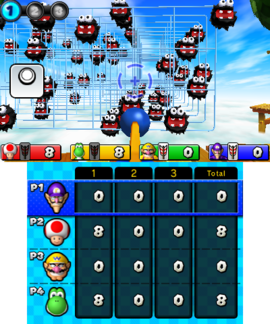 The player must use the Nintendo 3DS to aim at the Fuzzies. They then pull back on the to ready their bow, and release it to fire. The player that has fired at the most Fuzzies in three rounds wins. Rules – "Please pay attention to your surroundings and be careful when moving your system. Aim by moving your system, and try to hit as many Fuzzies as possible with an arrow. If the gameplay becomes unstable, place the system on a flat surface to recalibrate. You can also press down on at any time to center your view." Spanish (NOE) Apunten, disparen... ¡Fuzzy! Aim, shoot... Fuzzy! This page was last edited on May 20, 2018, at 18:10.